Got a great product that’s selling well? Fantastic – for now. It won’t last unless you nail your branding and customer experience. When it comes to brand differentiators, customer experience is predicted to overtake both product and price by 2020. This means that your profits will suffer if your sole focus is your product and its price. But customer experience by itself is redundant unless it’s informed by your branding. CX is essentially how people perceive you and the way you treat them. When you get it right, it makes people feel good about your brand and sales increase. When you get it wrong… your bottom line is affected. At the heart of a unique customer experience has to be your branding. This is what will set you apart from your rivals. Let’s take a look at exactly how to use branding to create a better customer experience. 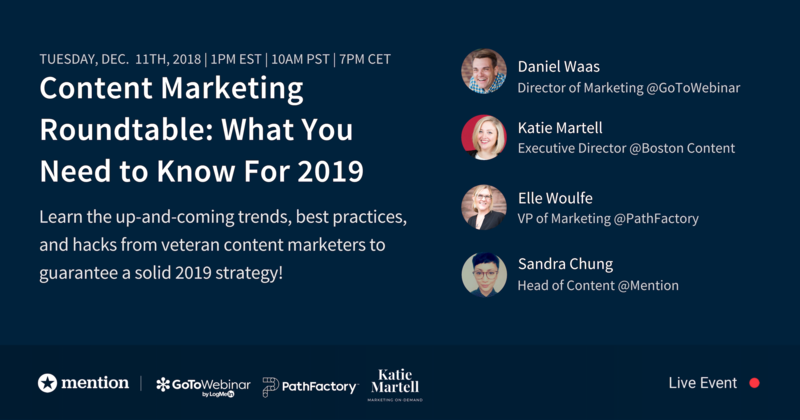 Don’t miss our Content Marketing 2019 Roundtable! Click below to sign up. Before you do anything else, make sure that your brand is clear, and that it represents who you are as a company. A study done by HBR found that 64% of people cite shared values as the main reason they have a relationship with a brand, so it should be clear and significant enough so that your customers connect with your brand. This means creating a logo, a consistent color scheme and message that accompanies all your marketing efforts. If you haven’t started yet, first define your brand’s values and purpose. Then, use a logo maker tool to create a professional logo. Decide on what colors will best resonate with your target audience, and then clarify your voice and the message you want to get across on all channels to your customers. Shopify have a great logo maker that is free to use and offers 100s of templates to get you started. You’ve long heard it said that customers shop based on their emotions. Research has backed this up, proving that over 50% of the customer experience is based on the emotions that push a shopper in a certain direction. A product by itself isn’t always compelling. What you need to do is make an emotional connection with people so that they make the decision you want them to make. The way we do this is by using our branding to create a feeling. Remember, it’s this feeling that’s going to make a person take action. Take a moment to think about how your branding can trigger a key feeling among your customers. For example, Nike’s ‘Just Do It’ slogan that accompanies their ads makes us feel a certain way, as did Apple’s famous ‘Think Different’ slogan. How you go about pushing emotional buttons depends, of course, on your demographics. Use your analytics to learn more about your audience so that you can give them the user experience they crave. Remember, a product by itself isn’t going to sustain your business. Your branding will. Go beyond the product, find who your audience is and then work out a way to push emotional buttons so that you make the right connections with the right people. This is your brand – but in many ways, it’s also your customers brand. Essentially, what you want to do is bind your brand to an experience that each consumer remembers distinctly as their own. Coca-Cola did this before hyper-personalization became a thing. Remember their #ShareACoke campaign? Thanks to that campaign, the soft drinks giant sold 150,000,000 personalized bottles in 2014. And that isn’t counting the non-personalised bottles. Customers want a hyper-personalized experience in nowadays. This means they want an experience that’s been tailored to them and their needs. The only products they should see on your website are what they’re actually interested in purchasing – as opposed to generic products that are displayed to everyone. This hyper-personalized experience is based on each customers’ past purchases, preferences, shopping histories and demographics that you can track via your analytics. Once you’ve got your data, segment your customers and tailor the experience so that it matches specific customers’ needs. For the user experience to be a good experience, it’s imperative that you improve your customer support. After all, 60% of users hate waiting more than a minute for a support response when they are online. Chatbots work because they deliver fast, helpful responses to customer queries that keep them on their purchase journey. Moreover, when you infuse a chatbot with your brands values, you’re using your branding to inform your customer experience. A customer’s interactions with a chatbot needn’t be the cold, impersonal interaction that having a conversation with a robot sounds like it would be. Instead, a chatbot is a blank canvas onto which you can transfer your brands values and personality. This makes your customer experience more familiar and personable, and can help to improve conversions and sales. Social Influencers can do many things for your brand and customer experience. For one thing, they can open up and give you access to many social media channels that were previously hard to reach. This is important because while your customers might not be everywhere, they are to be found across many channels, and they want a multi-channel experience. Social Influencers, then, raise awareness and they also drive engagement and can encourage more purchases. Of course, there are many influencers out there and the key is to find an influencer that is right for you and your brand. To this end, any social Influencer you work with needs to be relevant. Their content and message have to align with yours, and they need to share your values. Engagement is key, too. How many of their followers are commenting, liking and sharing their posts? What’s their reach like as well? It’s a good idea to work with micro influencers. These are trusted and authentic Influencers who have a dedicated following of around 1,000 to 100,000 users who you can use to help improve your own customer experience with solid content. Content that creates the emotional connection we talked about earlier. Audible collaborated with Jesse Driftwood, a photographer and filmmaker. The agreed on a sponsored photo and it got over 300 comments and 10,700 likes – an engagement rate of 30%. The customer service experience is often shared publicly across social media channels. And as you may have noticed, negative experiences are often shared more than positive ones. With the correct social media listening, though, you can catch these complaints quickly and respond in a timely matter. Just like JetBlue Airways did. When your company starts using the correct social media monitoring tools, this process can become an easy task. Your brand will soon be known for its excellent online reputation, all while increasing its internet presence. Lastly, what do you want your brand to be known for? If you want to be known for trust, you need to start educating your customers. For a prospect to buy from you, they need to trust you, your brand and your products. The easiest way to build trust is by educating them. Free educational content is what many businesses around the world now offer in the hope that their customers see them as helpful, reliable and trustworthy. Moreover, the more free educational content you give away, the more goodwill people will feel towards you. A great example of this in practice is Moz’s weekly Whiteboard Friday. It is a weekly video series by Rand Fishkin and the team at Moz where they provide fantastic educational content for their website visitors. Become a trusted source of info and your brand, your customer experience and your customers will benefit. These are ways that your branding can shape your customer experience as we move into 2019. Remember that at the heart of all this is your customer. It’s not about the experience you want to create, it’s about the experience they want to have. Define your values and then work on creating emotional and personal connections with your customers via your content and your interactions. Michelle Deery is the content writer and editor for Heroic Search, a SEO agency based in Tulsa. Her content has been featured in Entrepreneur magazine. She primarily writes content about eCommerce and customer experience. Her work helps businesses boost their profits.